These three drivers of gold prices explain why gold is down, and will continue to decline. No other metal is quite like gold. Physically, its malleable, it does not tarnish, it conducts electricity. Gold can just as easily be pulled into a wire as it can be hammered into a thin sheet or cast in a mold. And, there is also that certain aesthetic appeal. But the real difference between gold and most other metals is that gold has another, intangible quality. Its an investment asset. 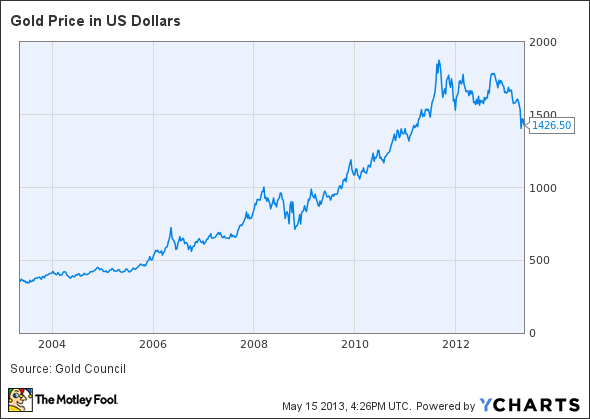 Gold appreciated at a torrid pace from the mid 2000s through Q4 2012, but has since reversed. Has the trend been broken, or is this a temporary correction? What is driving the suddenly new world of investment gold? Gold Price in U.S. Dollars data by YCharts. Gold has three general uses, all of which contribute to the underlying value of the investment. There is demand for gold for use in industry, demand as a liquid asset alternative to cash, and demand as a safe harbor to market and inflation risks. Are people just wearing more jewelry? The most obvious use is as a commodity with applications in industry, primarily as jewelry, but also in dentistry, technology, and others. According to the World Gold Council, demand for physical gold was down 4% year over year. Jewelry demand was down 3%. Simultaneously, new gold supply was up 2% while recycled gold supply was down 5%. All said, supply and industrial demand were by and large equal -- so we can conclude that industrial use is not the driver behind the volatility in gold prices. Within the investment world, demand for gold can generally be broken down into two components: a liquid alternative to cash, and a safe harbor hedge on inflation and broader economic risks. First, gold is a liquid investment. According to a 2011 study by the London Bullion Market Association, over $15.2 trillion of gold was traded in the first quarter of 2011 alone. For comparisons sake, if we assume an average share price of $13 for Bank of America in April 2013, the 2.9 billion total traded shares equal a monthly exchange of $37.7 billion. Multiply that by three months, and Bank of America's quarterly share volume equals approximately $113 billion. Based on these estimations, nearly 115 times more money was exchanged in gold than in one of the largest banks in the world. This by no means a rigorous analysis, but it paints a very clear picture for just how liquid gold really is. With memories of Bear Stearns and Lehman Brothers still fresh, institutional investors have flocked to gold, in part because it is a safe and liquid alternative to housing cash in a banking system rocked by turmoil. The environment today has changed. The banking system in general is more stable, capital levels are significantly higher, and banks are no longer deploying leverage in the 25-30 times range. As the financial sector heals and confidence returns, the investment demand for gold as a liquidity play will decline. Lower future demand means lower future gold prices. Gold demand is also driven by its stature as a safe harbor from both inflation and economic uncertainty. Beginning with the first stimulus package under President Bush and Treasury Secretary Paulson through to Ben Bernake's current quantitative easing programs, U.S. monetary policy has been to flood the world with dollars, drop interest rates to zero, and do everything possible to spur spending and growth. The risk in this is future inflation, and it's no coincidence that investors have sought out gold as protection from this possibility. But, as it turns out, inflation has yet to manifest itself. According to the Bureau of Labor Statistics, inflation in March was only 1.5%, well below the Fed's 2.5%-3% goal range. By some measures, such as today's data on wholesale prices, there is real risk of a deflationary environment. Again, with current inflation at these levels and future expectations remaining low, dollars will flow out of gold and into other asset classes. There is absolutely still risk and uncertainty in the markets. But, there are increasingly positive signs. The S&P is above 1,600, the employment picture continues to improve, and very smart investors are talking about an economy and market strong enough to start phasing out the QE programs. 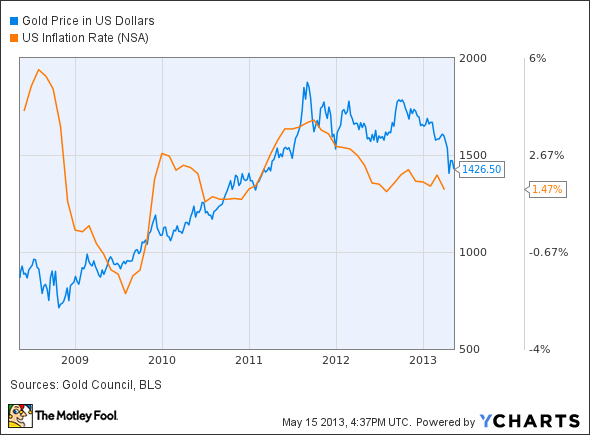 As the economy continues to improve, the price of gold will continue to decline. The numbers point to the change. From the same World Gold Council report, investment demand is 19% above the 5 year quarterly moving average, but was down 8% from Q4 2011 to Q4 2012. Demand for gold ETFs was up 51% for the year in 2012, but was down 16% quarter over quarter. The fundamentals have changed in the economy, and the bull market is reversing. First, consider reducing or eliminating holdings in the SPDR Gold Shares (NYSEMKT:GLD), the largest gold ETF backed by bullion. Alternatively, a long position in the S&P 500 would be an effective hedge to gold, as the changing fundamentals sending gold lower will continue to fuel the S&P higher. Gold miners are another sector at risk. At the top of the list is Newmont Mining Corp. (NYSE:NEM)the first gold company included in the S&P 500 with a market cap today of just under $16 billion. The stock is down approx. 30% year to date, driven primarily because of exposure to the price of gold on the markets. Newmont's Q1 earnings presentation highlighted several early indications of the changing fundamentals, including reduced adjusted net income driven by lower pricing and volumes, a 28% reduction in cash flow from operations, and cost savings through reduced capital spending on future projects and exploration. Breaking gold down into its three fundamental demands makes the case that its bull run is over. As long as inflation remains in check, employment data continues improving, and the economy in general continues to heal, expect gold prices to continue to decline. And remember: This change is a positive sign. It's evidence of a recovering U.S. economy.